Our country restaurant's house salad is an all-around customer favorite. Crunchy Fuji apples, fresh salad greens, walnuts and Swiss cheese combine well with Eckert's Sweet Apple Cider Vinaigrette. The following recipe, part salad and part pizza, uses some of the same ingredients that make our house salad so famous. The dressing and the feta add savory flavors while the apples sweeten the deal. a few days ago so I just used what was within arm's reach. I used my mandolin to slice the apples thin but this can also be done with a steady hand and chef's knife. A quick trip to my landscape bed resulted in some aromatic chives. Then, I assembled my pizza in minutes and shuffled it off to the oven. While my pizza was baking, I toasted walnut pieces in a skillet over medium heat until they started to smell fragrant (about 3 minutes). Then I whisked the dressing ingredients together and was ready to top my pizza when it came out of the oven a few minutes later. Chris and I enjoyed this light dinner along with some sliced meats from our deli. I hope you enjoy it as much as we did! Preheat oven to 425 degrees. Place crust on a pizza pan or baking sheet. 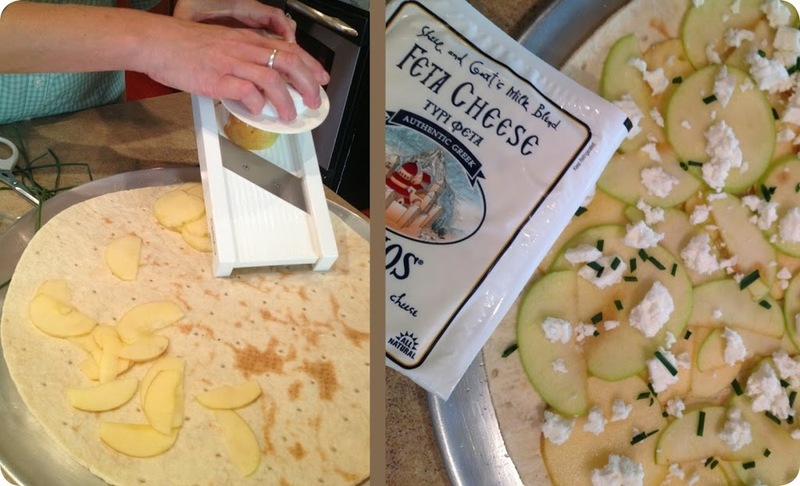 Arrange apple slices evenly over the pizza crust and crumble cheese over the top. Sprinkle thyme leaves over cheese. Bake pizza for 8-10 minutes or until cheese begins to brown. Sprinkle toasted pecans over the baked pizza. In a medium bowl, combine oil, mustard, lemon juice and honey with a whisk. Add arugula and toss to coat. Top pizza with arugula and cut into wedges before serving. Thank you for stopping by to check out our blog - print or show the coupon below to receive a FREE bottle of our Apple Cider Vinaigrette Dressing when you buy one at regular price. Don't forget to subscribe to our blog to receive delicious seasonal recipes delivered to your inbox every week.